These yummy looking Carrot Truffles are my favorite as they are so quick and easy to make. Not only that you can customize it so easily with healthier options. Carrot is one of my favorite vegetable to use in desserts for its natural color and sweetness. You can definitely use other veggies like Beet, and Bottle gourd(Dudhi or Lauki). Some colorful nutritions fruits and veggies are perfect for making natural flavored colored desserts and treat. These carrot truffles are vegan and gluten free as well. Carrots are one of the best sources of carotene which is a strong antioxidant, but carrots also contain other phenolic compounds that are antioxidants. Many people do not realize that numerous phenolic compounds are located in the skin of fruit and vegetables, many of which are removed by peeling prior to processing. So for this recipe, if desired, keep the skin. Carrots are an excellent source of vitamin A, providing 210% of the average adult’s needs for the day. They also provide 6% of vitamin C needs, 2% of calcium needs and 2% of iron needs per serving. To add more nutrition, I also add almond meal/flour and grated coconut to this recipe. And again, if desired, keep the skin of almond as well for this recipe. Now, there are two ways to prepare this recipe. Traditionally, Turkish cuisine prepare the puree of steamed/boiled carrot and then cook with sugar till thick. But I thought of eliminating that and follow Indian traditional recipe of Gajar Halwa aka Gajrela. So I grate the carrots and prepare this recipe as below. On a medium heat, mix shredded carrot and sugar into a medium sized pot. Cook the mixture till thickened. It takes about 15-20 minutes but if you are using wide pot, may cook faster. Once the mixture is thick, turn off the stove and add remaining ingredients like almond meal, coconut, cardamom and rose essence. Mix everything well. When cooled, start making ball. Take about a tbsp of mixture and roll into smooth balls. Roll the balls into coconut or ground nut. Use small cupcake liners to place the each ball for nice decoration. Enjoy same day or refrigerate for longer. 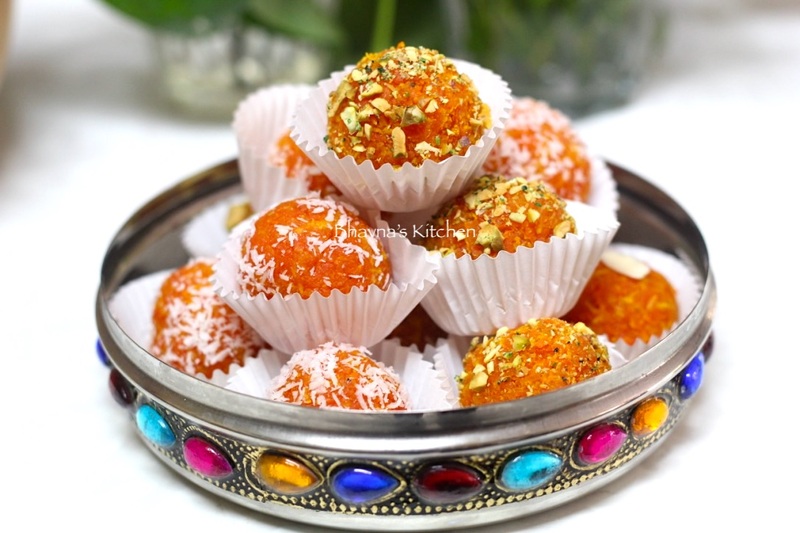 This treat is perfect for auspicious occasions as a prasad as well.